The discussion panel at Kol Chai’s ‘Mental Health Awareness Shabbat & Brunch’ attracted a wide cross section of ages and questions from the Hatch End Reform Community. 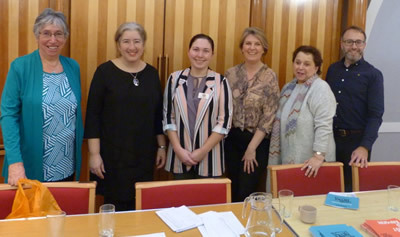 As part of Reform Judaism’s Communities that Care Initiative on mental health, Kol Chai’s Rabbi Naomi Goldman held a special Shabbat service followed by brunch and a lively question and answer session with an invited panel of experts. Representative from Harrow Samaritans, OLLIE (one life lost is enough) – who work around teenage suicides – and from the Harrow Citizens Mental Health Action Team spoke about the current issues affecting society’s mental health and what their organisations are doing. Isobel Laurence, Kol Chai’s link with the Harrow Citizens MH action team, has piloted a ‘blueprint of help and contacts’ which she is currently promoting within Harrow Council. She said she was “delighted with the interest and support shown by the Kol Chai community for this crucial subject”.